Free Shipping Included! 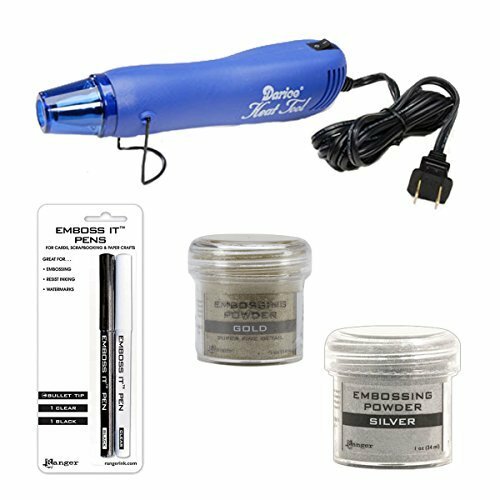 Embossing Starter Kit: Heat Tool Machine, Emboss It Pens, Ranger Gold and Silver Powder by Ranger at Designers Artists. MPN: 43216-97428. Hurry! Limited time offer. Offer valid only while supplies last. Multi Purpose Embosser Heat Tool: Emboss and shrink-wrap to your heart's content with this handy heat gun. Ranger Inkssentials Embossing Pens, 2-Pack: Pens contain a specially formulated ink that stays wet on paper, providing the tack needed to attract and retain embossing powders until they are cured with heat. Ranger Embossing Powder, 1 Ounce Jar, Super Fine Silver. Ranger Embossing Powder, 1 Ounce Jar, Super Fine Gold. Embossing is a technique that allows you to add raised elements to paper craft projects. Embossed elements are created by stamping or drawing images onto card stock or paper with heat-embossing-friendly ink, then covering the inked area with special powder that melts when heat is applied with a heat gun or heat tool.